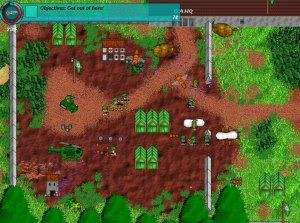 The Worm Wars series places the player in the role of the worm army fending off the attacks of the evil ant army in a battle for garden supremacy. All the games in the series are different; with games 1 and 4 focusing more on action, and 2 and 3 more on strategy. The last in the series, this game is by far the fastest paced game. This time, the screen also scrolls to allow for much bigger levels. This game also has a two player co-op/skirmish mode.